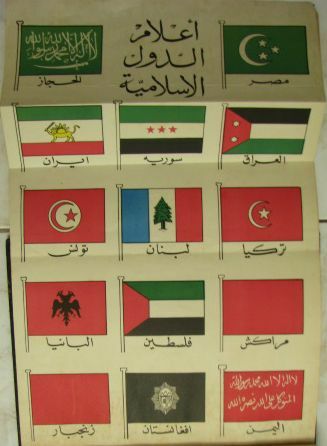 Flags, Arab, 1930s (from 1936 book: The History of Arabia) . The one flag of interest is the red one with white lettering in the lower right corner. Early Dubai? No, Yemen (per the caption, al-Yaman). I am curious as to what the first 2 on the 2nd from bottom row are, the first resembling Albania? Also - looks like 2nd last is older Afghanistan, but that does not stand up to the Vexillological chronology of that Nation given the 1936 date. Another point here - Why are Arabic flags being displayed on the plate in the manner they are (ie staff to the left)? When one would expect to see "sinister hoisting"
I am confident that the one resembles Albania because it is Albania. Calling the chart "Arab Flags" is a misnomer, as the presence of Iran and Afghanistan shows. It is Muslim flags (allowing for Lebanon being c. 50% Muslim) and Albania is amajority Muslim nation. I will take a guess that the flag next to it is an inaccurate Transjordan, with truncated triangle and sans star. As for Afghanistan flag charts are notorious for being out of date, and I imagine that in the '20's and '30's all news, but especially vex news, was slow getting out of Afghanistan. Al-Irak, Suria, Iran, Turkiya, Libnan, Tunis, Marakesh, Falastin, Albania, Al-Yaman, Ahghanistan, Zanhibar. However, I missed the upper two which are Misr and Saudia. Some minor corrections probably just typo errors. Zanhibar should be Zanjibar and the text accompanying first flag is Al-Hijaz.